Welcome, listeners, to a another episode of Chip Damage Control, the official ChipDamage.com podcast. Recorded at the official Control Room of yayze’s secret lair. This week, we get around to the pre-E3 show and talk about what games we want to see at E3 and our top 5 coming out of it! Stay tuned next week where we will talk about what actually happened there. The highs and lows. What we saw, what we didn’t see. Listen in and check us out at http://ChipDamage.com and follow us on Twitter at http://twitter.com/chipdamage. This is it the big Winnipeg major! 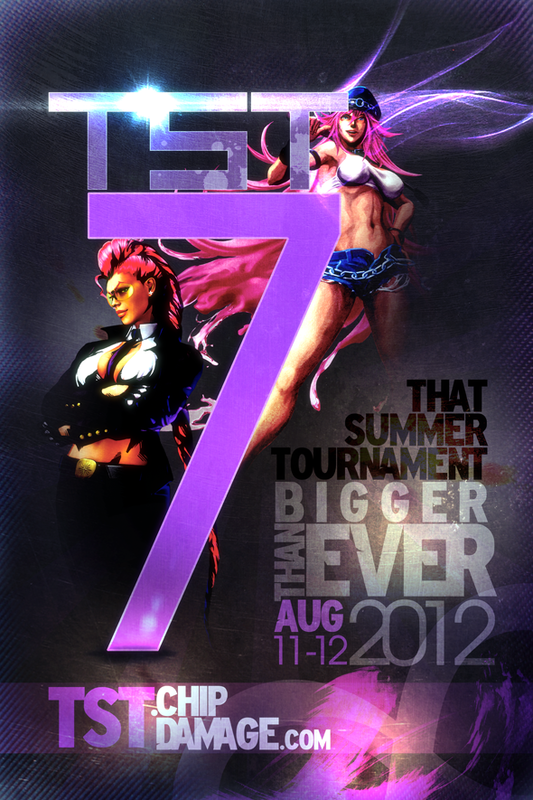 This is the tournament where you want to perform your best, well at least for the ones not going to Evo. Shane again is the top player to gun down in several games. Russel is the defending champ at TST but Wilson has been running through him in the past few tournaments. Can he finally come through and win the big one? Those are some of the stories going into the event. Be sure to get in the practice and lets put on a show! With some of the new games coming out we are planning to run tournaments for them. The list is subject to change depending on what you guys want. Remember folks that this tournament doesn’t run without input from everyone. If enough people speak up we will do what we can to compensate for it. On to the details. Please keep in mind that things may change between now and TST in August, seem keep your eyes on here and on the original forum post for TST IV. The schedule for TST can be found below. It’s that time again. Baselan 17 “CINO” will be happening this weekend(Friday-Saturday). 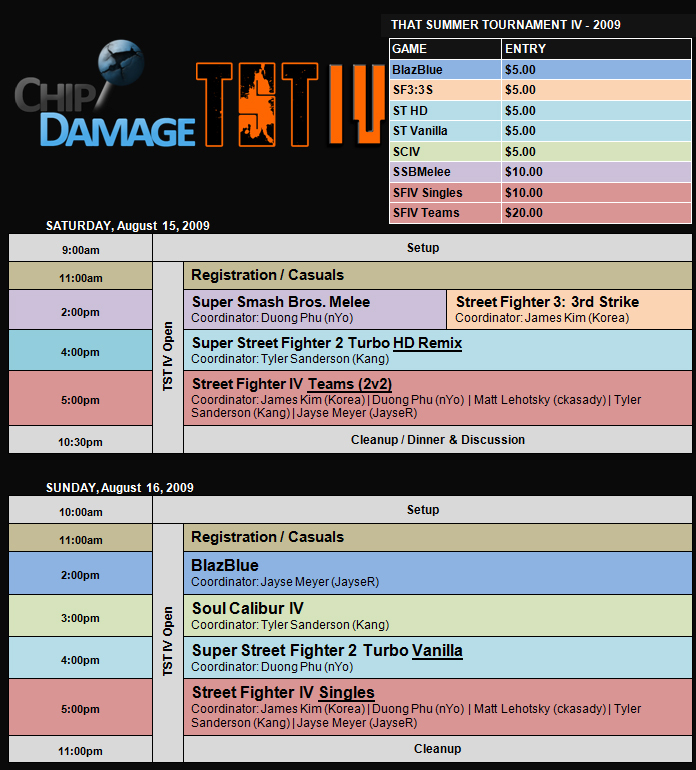 Of course, yours truly(Chip Damage) will also be there on Saturday to hold the only two big tournaments for the consoles, including Street Fighter IV on the PS3 & Super Smash Bros. Melee on the Gamecube. The full details for the two tournaments can be found below or on the official forum post, here. If you know you are going to be late for one of the two mentioned tournaments but would still like to be placed in the bracket, call nYo(Duong) @ 293-6446 before the tournament start time and let us know you will be late but would still like to participate. If you’re too late and we need to move on we will move as far as we can without you but if you can’t make it on time still we’ll drop you to losers. 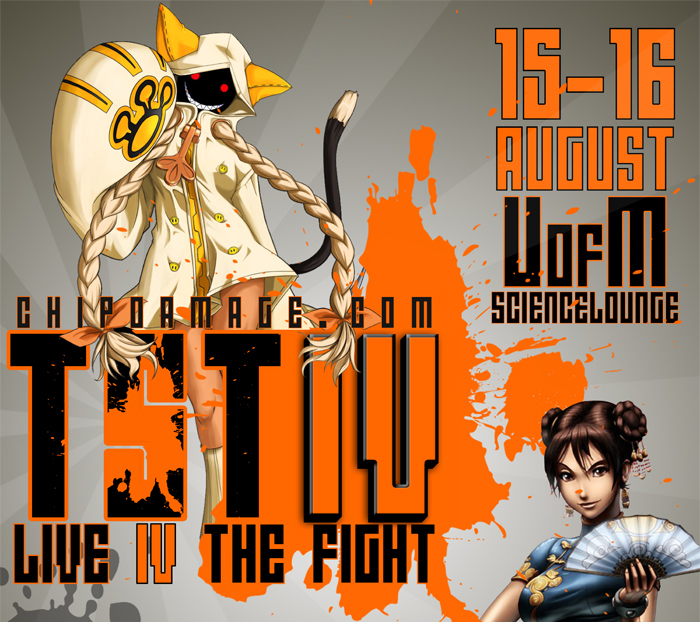 There will also be casuals before the tournaments and SF4 casuals Friday night. Stop by to get some games in. Winner must stick with their chosen character in the next round (does not carry onto other matchups). Loser may change character if they wish. Matches will be run in best 2 out of 3 (outside the game’s own round settings) with the Winner’s, Loser’s and Grand Finals being best 3 out of 5. If you wish, you may request a double-blind pick. What will happen then is both players will secretly tell the director their character choice(s) and must choose that at the start of the round. Players are highly advised to supply their own controllers. We claim no responsibility if you are unable to find some way to supply yourself with a controller. For pad players, you are required to turn the pad you are using OFF or face being down a round in the following set or DQ’d altogether. Hardware macros, rapid-fire, or other hardware assisted mechinsims are strictly forbidden. Accidentally pausing the game at any time during the fight may force you to forfeit the round (solely at a judge’s discretion). Stages limited to 6 “neutral” stages for random, others open for counter picks. Each person may knock out one stage for the entire set. The first round stage is selected by random, but if both players (teams) can agree on a stage then the first match can be played on any stage they agree upon except one from the banned list below. The winner of the first round may change characters but they have to select first then the loser selects their’s and then follow by selecting the stage as well. If you wish to have the game paused, you must request that your opponent do it, otherwise he has the choice to restart the round on a level of his choice. This rule does not apply to sudden obstructions and catastrophes.